Whether you’re a complete beginner or an experienced musician looking to take your playing to another level, private lessons provide the opportunity to get the personal attention that can be beneficial to your growth as a musician. Lessons are scheduled weekly, for 30 or 60 minutes. Our experienced and professional faculty will work with you to develop an individualized program that helps you achieve your musical goals. The Handmade Music School teaches fiddle in the traditional by-ear style. 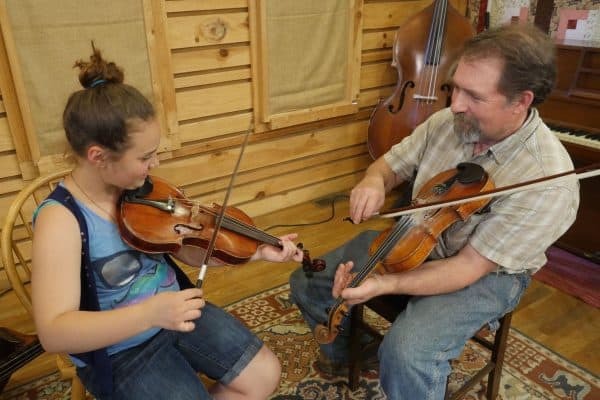 Taught by Mac Traynham, an accomplished fiddler who has taught at numerous music camps and won many ribbons from various Fiddler’s Conventions. 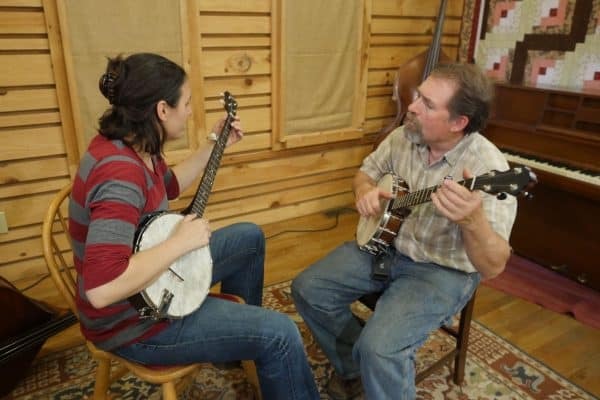 The Handmade Music School teaches clawhammer banjo in the traditional by-ear style. Taught by Mac Traynham, an accomplished banjo player (and banjo maker) who has taught at numerous music camps. Beginner clawhammer banjo is taught by Jenny Traynham. Clawhammer banjo students should determine what level they are in order to determine the best instructor for them. Click here for our level descriptions. The Handmade Music School teaches old time rhythm guitar in the traditional by-ear style. Advanced students will be taught by Mac Traynham, who has developed a solid old time rhythm guitar style based on the important regional guitar players of the past. Jenny Traynham, also a strong rhythm guitarist, also teaches old time rhythm guitar to beginners and intermediate students. Old time rhythm guitar students should determine what level they are in order to determine the best teacher for them. Click here for our level descriptions. The Handmade Music School teaches bluegrass banjo in the traditional by-ear style. Taught by David Cannaday who started teaching at 15 years old. He has worked in music stores and teaching studios ever since. David is currently teaching on Thursdays and accepting students for bluegrass banjo, guitar, mandolin, lap dulcimer & autoharp. 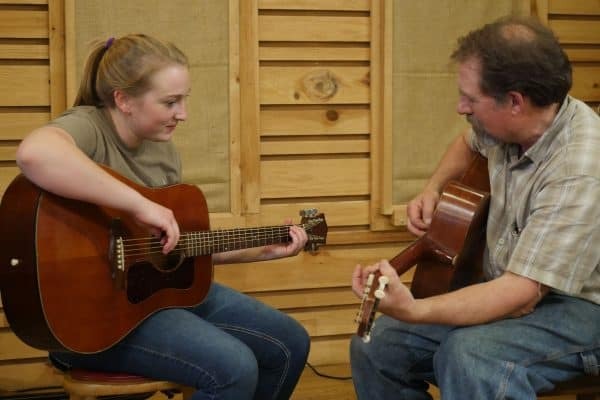 The Handmade Music School teaches bluegrass guitar in the traditional by-ear style. Taught by David Cannaday who started teaching at 15 years old. He has worked in music stores and teaching studios ever since. David is currently teaching on Thursdays and accepting students for bluegrass banjo, guitar, mandolin, lap dulcimer & autoharp. The Handmade Music School teaches fingerstyle guitar in the traditional by-ear style. Bill Adams teaches Fingerstyle guitar. Bill is an accomplished multi-instrumentalist who is well-versed in the fingerstyle guitar styles of Merle Travis and Chet Atkins. The Fingerstyle Guitar lessons are designed for intermediate and advanced students only. Students should determine what level they are at before beginning these lessons. Click here for our level descriptions. The Handmade Music School teaches Dobro in the traditional by-ear style. Taught by Bill Adams who has been playing Dobro in a variety of styles for many years – including playing steel guitar for Western Swing and classic Nashville country bands and playing Dobro and rhythm guitar in many local bluegrass bands. Bill offers Dobro lessons for Beginners to Intermediate students. *The availability and scheduling varies from teacher to teacher.